This year begins with two Lunar eclipses, one partial and one full during a full moon in Leo that was the first full lunar eclipse of the year! The earth, moon and sun are in alignment helping to reset emotions for a fresh start. This is a time to just be you, brave, beyond fear, and leading from your heart against all odds. 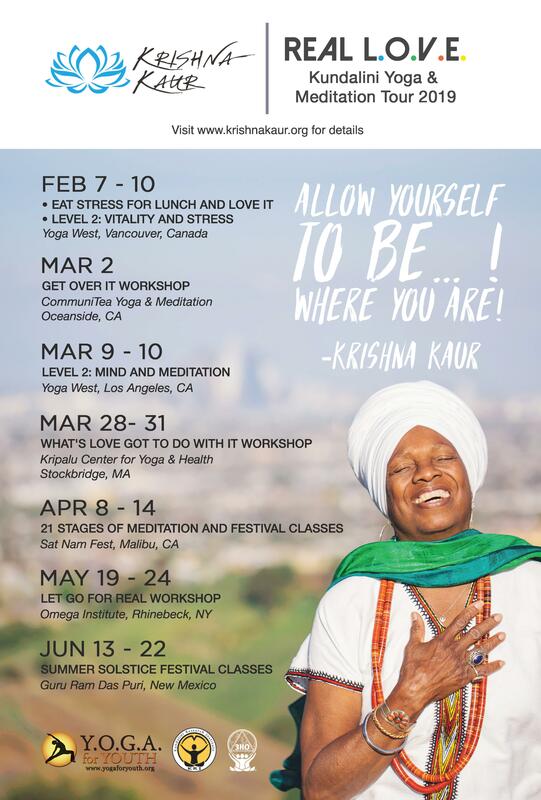 What better way to experience this opportunity than to deeply embrace the spirit of LOVE by joining Krishna Kaur on her 2019 Real L.O.V.E. Tour! LOVE will be the central theme for her Kundalini Yoga offerings this year. With Krishna you will laugh, go deep, celebrate you, focus on Inspiring personal messages from Yogi Bhajan and more. So, stay tuned for opportunities to join Real L.O.V.E. in person where ever Krishna may be.